I’ve wanted to go on a trip with my mom for awhile and was waiting for just the right opportunity to come along. That happened this weekend and it all began with dinner at Harry Caray’s Tavern on Navy Pier and a Desperate Housewives premiere party with hunky James Denton (a.k.a. Mike Delfino). It was my first trip to any Harry Caray’s so before the festivities even began we sampled some drinks and food. The drink menu is extensive, including a large selection of beer and wine by the glass, as well as some signature cocktails. We started with something sweet with Mom sipping Egon’s Ecto Cooler, a combination of Effen Black Cherry Vodka, Midori, Pineapple Juice, Crème de Cocoa and club soda that she said tasted like a bubbly fruit punch. I went for Levin’s Howling Wolf, a mix of Hpnotiq Liqueur, Malibu Rum and Pineapple Juice. The food menu at Harry Caray’s Tavern really has something for everyone, whether you are looking to snack or have a full meal. We started with the Spinach Artichoke Dip, which was very creamy and full of veggies, served with tortilla chips, a perfect complement to the sweet drinks. We declared it a meat night for dinner and – with a little help from waiter Nick, who is hoping to follow James Denton’s footsteps and go from waiter to television star – Mom got the rib eye and I had the Holy Cow! Burger with cheddar cheese and sautéed mushrooms on an egg bun. It was tender and juicy, as was Mom’s steak, and I really enjoyed the Roasted Vegetable Pasta Salad on the side. 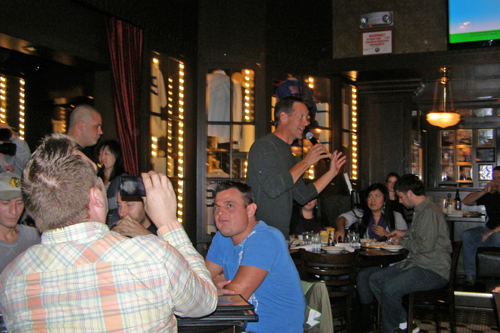 James Denton is a part owner at this Harry Caray's, part of a chain of restaurants he was once a waiter at. He invited his friends and fans to join him for the seventh season opener of Desperate Housewives . Denton was a perfect host, giving us tidbits between commercials -- it was not well-received when Ricardo Antonio Chavira (Carlos) walked onto set for the first time this year without his infamous goatee; Doug Savant (Tom) wasn’t moving around much because he had been recovering from a knee replacement -- and dolling out lots of swag, including signed hats, tee shirts, aprons and even scripts. Fortunately, I’m not expected to take my shirt off in front of millions so I enjoyed sharing the Chocolate Chip Cookie Sundae Skillet with Mom. I also took Denton’s suggestion and washed it down with a “Delfino,” strong enough to make a plumber proud but sweet enough for me. While in Chicago, Mom and I also went to the Art Institute (my first time and definitely not my last) and stayed at The Palmer House Hilton, which was so wonderful it deserves much more than a paragraph here. 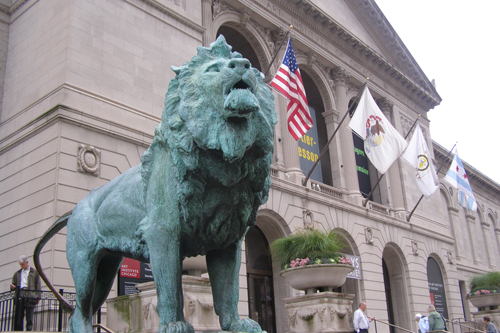 Come back for all the lavish details…. P.S. 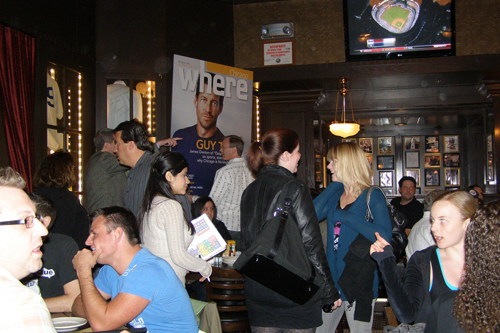 If you miss James Denton when you’re down at Harry Caray’s Tavern, you can catch him and on the cover of Where? Chicago this month. 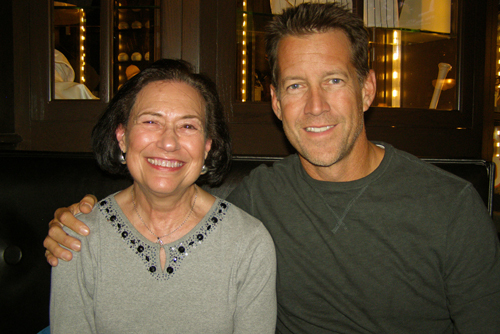 Above: Mom with Desperate Housewives star James Denton. I loved this, Marcia! Very informative. Sure looks like your mom had a great time.